JOINN! is located in the former PTT Post Office and railway station, in Het Rond Shopping Centre in Houten. The main entrance of JOINN! is 50 meters away from Houten railway station. From Houten-NS, there is a train to Utrecht Central 4x per hour (travel time 7 min) and a train to Tiel/ Geldermalsen/ Breda/ Den Bosch 4x per hour. If you are having a meeting at JOINN! you will receive a free exit ticket from us. Turn into the 'De Molen' neighbourhood on the Rondweg. Drive all the way to the end of the road and you will arrive at the Kruitmolen parking garage. When you come out of Albert Heijn supermarket, you will see the main entrance of JOINN opposite! Turn into the 'De Haag' neighbourhood on the Rondweg. 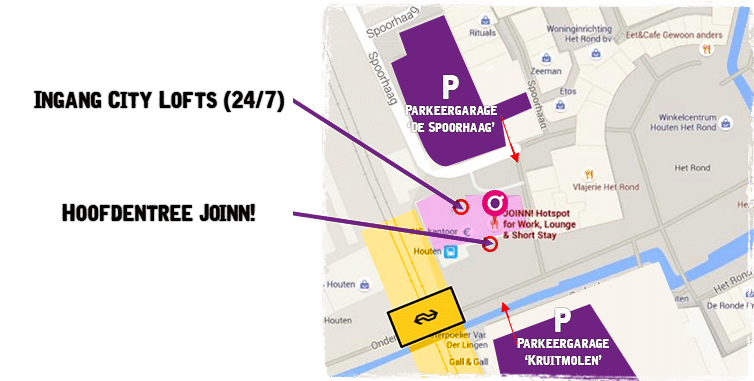 Drive all the way to the end of the road and you will arrive at Spoorhaag Parking Garage. When you come out of Jumbo supermarket, you will see the white JOINN! building on your right. The main entrance is on the other side of the building. To get here, go through the narrow alley. At the end of this alley, turn right and you will see the main balcony and main entrance of JOINN!